Magnet Commerce allows you to view a detailed list of your online store's members. These can be customers that have performed one or more orders, have subscribed to your newsletter or have just registered as members to your online store. Figure: Use the "Members > View" tab in the Administration Panel to view your e-store's members. All members of your online store are listed on the "Members > View" page. Each column on the Members List can be sorted in ascending or descending order, by clicking the title of the column. For example, to sort members in ascending order by ID simply click on "ID". To sort back in ascending order, click on ID again. Figure: All members of your online store are listed on the "Members > View" page. ID: Lists the member ID number which is automatically given to each member upon subscription. Member email: Lists the member's email address. 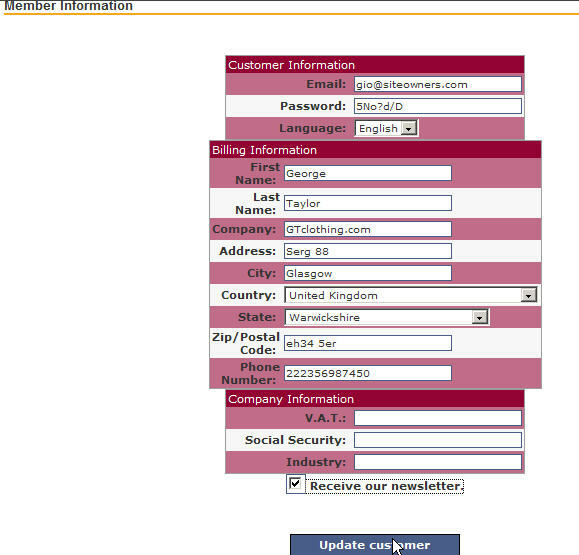 This is used for sending order confirmations, your newsletter etc. It is also used by the member to login to your online store. Member name: Lists the member's name. Names are listed by "Last Name, First Name". Number of orders: Lists the number of orders that a member has performed. Total amount: Lists the total amount that a member has spent. Actions: Shows you "Edit/Delete". 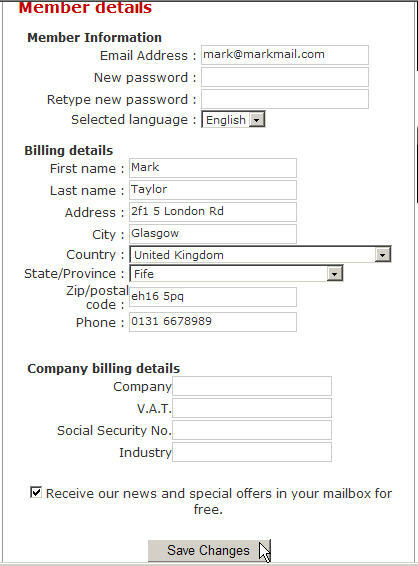 By clicking on "Edit" you will be allowed to edit member information such as country or billing information. You can also Delete a member by clicking on "Delete".
! When you choose to "Delete" a member, the member's information will totally be deleted from the system so make sure you really want to do this! To view "detailed member information" from the "Members List", click the "Edit" link in the "Actions" Column. This will take you to the "Member Information" page. Figure: Detailed Member Information. Top Screen. -- Email: The member's email address. This is used for sending order confirmations, newsletter etc. It is also used by the member in order to login to your online store. -- Password: The password the member uses to login to your online store. The password is created automatically by the system upon member subscription. All this information is provided by members upon subscription, but is also editable and can be changed by you at any time. Remember to click on the "Update customer" button to save any changes you have made! Figure: Orders placed by the member. Bottom Screen. The list contains information regarding the Order ID, the date and time that the order was performed and the total amount spent. Press the "Edit" link to view the details of an order. 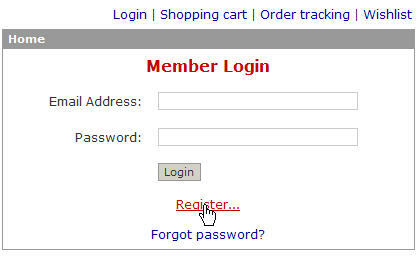 Figure: A store visitor can register by clicking on "Login". Figure: In the "Member Login" page the visitor can click on "Register" to subscribe. 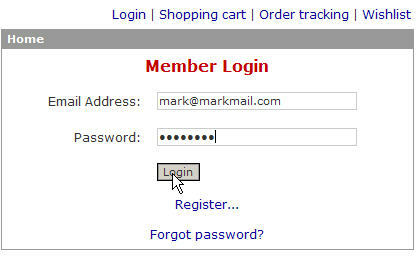 Figure: The visitor provides an email address and clicks on "Register" to become a store member. Place an order: When completing their first order your customers will automatically become members of your online store. The billing, shipping and company information given during checkout will be used for creating the customer's account profile.
! An existing store member will have to login before placing an order! A member of your online store can login to your store and change his/her account settings at any time. Figure: A member can login by clicking on "Login". Figure: In the "Member Login" page the subscriber must provide their login details and press "Login" to enter. Figure: Your store members can click on "my account" to access/edit their account information. Figure: A store member can change all account settings. Use the members search function to locate specific members. The Members List provides information about the members' ID, email, name, orders performed and amount spent. Press the "Edit" link to view/edit detailed member information, or the "Delete" link to remove a member from your system. Remember to click the "Update customer" button if you make any changes on a member's information page. Store Front: Your store visitors can subscribe to your store during checkout or by use of the "Login" > "Register..." links. All store members can login to your store and change their account settings at any time.